I’m not the biggest fan of winter, mostly because it’s so dang cold and I can never get warm. I kind of feel like that’s how fish might also feel about winter. Think about it…all spring and summer they are swimming around all happy in warm water, then slowly the water drops in temperature (or quickly depending on the year). Then their digestive system starts slowing down. The mind of a fish has got to be thinking “fml not this again!! Where did all the bubbles go from that sweet waterfall where I like to spend my time??!!! C’mon Jack, turn that waterfall back and feed me you jerk!” I like thinking that Koi fish have a little hostility and a sense of entitlement in them just because they are awesome fish…and it makes things more fun. Anyway…have you ever wondered how you might be able to make winter more enjoyable for your fish? 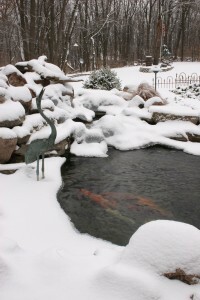 While we are not fish psychologists, we do know that there are a few important steps to take in winter for your fish, one being a pond aerator. 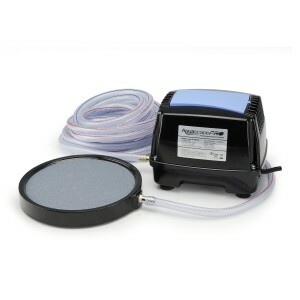 So what exactly can a pond aerator do for your Grand Rapids pond? Every living thing needs oxygen, fish are the same. And in winter, when the waterfall is shut off, temperatures drop, and ice forms over your pond…there is little oxygen being exchanged in your pond. So how do you get your fish oxygen in winter when they desperately need it? First, you need an aerator. Our aerators release a column of bubbles that help in the oxygen exchange in your pond. Second, there needs to be a hole in the ice. The simplest, safest, and most fish friendly way to achieve this is with the use of a pond heater. The pond heater won’t heat the water (I’m sure the fish wish it did), but when placed on the ice and turned on, the unit will warm up therefore melting the ice around it. This is also important for the exchange of deadly gases that can get trapped in your pond. In winter, oxygen & gas exchange is crucial for the survival of your fish. If you don’t have a pond aerator or a pond heater for your pond yet, it’s not too late. Contact us today to get a pond aerator or a pond heater, your fish will thank you!